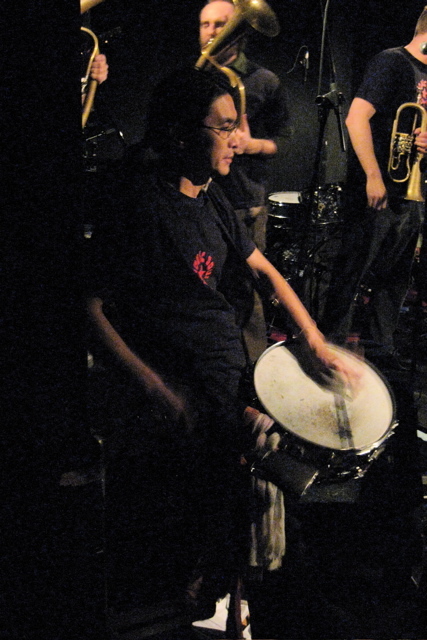 Take Toriyama, a musician who was a mainstay of the independent jazz scene in New York, has left us. He was perhaps best known for the joyous and infectious grooves he brought to Slavic Soul Party, but he lent his tremendous creative gifts to a staggering number of local bands, including groups led by Ben Monder, Yoshi Waki, Art Hirahara, Monica Heideman, Amanda Monaco, Tim Zeismer, Ayelet Rose Gottlieb, Anat Fort, Mark Small, Sebastian Noelle, Thomson Kneeland, Mike McGinnis, Paul Olenick, Gene Ess, Michael Bates, André Canniere, Loren Stillman, Dave Smith, Travis Sullivan, Josh Rutner, Pete Robbins, Adam Schneit, Stefan Zeniuk, Jamie Stratton, Eivind Ovspik, Curtis Hasselbring, Tim Kuhl, Justin Mullens, Tine Bruhn, Sean Conly, Nicolas Letman-Burtinovic, Ursel Schlicht, Katie Porter, Alon Yavnai, Tim Miller, Dave Allen, Michael Attias, Jonathan Moritz, Ben Holmes, Lars Jacobsen, Vardan Ovsepian, Joshua Davis, Brian Drye, Bruce Saunders, and a slew of others I'm sure I'm forgetting right now. There will be a farewell party and funeral for drummer Take Toriyama this coming Sunday. Donation for his family are deeply appreciated. Please give it to Yoshi Waki who is in charge for this party. I would also like to invite Take's many friends and colleagues in the New York jazz community and beyond to share their remembrances of him in the comments below. He will be sorely missed. 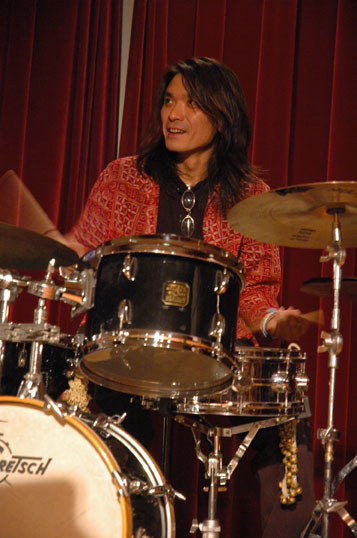 As many of you already know, our dear friend and colleague drummer Take Toriyama tragically died over Memorial Day weekend. There will be a march in his honor with members of Slavic Soul Party and other musicians leaving from Prospect Park this Sunday at 1pm and arriving at Barbès shortly thereafter for an informal gathering in his memory. We hope that his many friends and the many musicians he worked with will be able to attend. His parents and brother will be present. There will be a collection pot for private anonymous contributions that will help his family cover the expenses of their trip from Japan and of the funeral arrangements. We will gather, this Sunday at 1 PM, at 9th St. and Prospect Park West (parkside) and then proceed to Barbès. Take was such a beautiful human and musician and he will be so sorely missed. Sending love to all those who's lives he touched. This was certainly unexpected. I never met Take, but I think it was Michael Bates who first mentioned his name to me, out at Banff. My condolences to everyone in the community - it's a small one and each loss hits us hard. Take was a pivotal musician in my own musical development, and after 12 years of playing together, doing gigs and rehearsals on a weekly basis, touring together, and even living together, I can't possibly express what his loss means to me. Losing a best friend is incredibly painful; losing one of my musical "soulmates" is just as devastating. Everyday, I hear Take's playing in my own, all the ideas and aesthetics that we exchanged throughout the years from odd meters to Balkan grooves and Indian influences to lyricism and textures of beauty and silence. He was one of the few drummers to truly understand and utilize the power of silence and space, and this made him deeply original. Take was an incredibly unique man and musician and the most influential person in my own artistic development, turning me onto so much music and sharing so much on the bandstand and off. Take, thank you for your friendship and your final gift of recording my music these past few weeks. I wish things could have turned out differently, and you and your playing will always have a place in my heart and my music. I feel the need to leave something here as much for my own personal healing as for Take and his family and friends as we all struggle with his death. I had the pleasure of being Take's roommate in Boston. He was an incredible individual, a master musician and one of the most respectful and intelligent human beings I have ever met. He always emitted a positive energy. We talked a lot about drumming history, music, cymbals; he shared his drumming wisdom with me in our basement studio sometimes. His own drumming was perfection; he was a uniquely original virtuoso. He was a bit of a workaholic when it came to music, constantly traveling between Boston and NYC, always out playing gigs, recording or rehearsing. He had the best attitude, no ego at all, nothing but kind words. He once gave my cat a tomato juice bath in the sink after my cat got sprayed by a skunk while I was out. Take would do anything for you! When he left our house to make his move permanent, I was sad to see him go. But it only made sense; New York City deserved to have this drummer. I will miss you Take, you will live on in our hearts and spirits! I can't believe you're gone in such a flash. You were such a creative rhymicist and I loved playing with you over all these years. What a hole you have left in our music community. You will be missed and remembered by many forever. I'm so disappointed in learning of this loss and can only take solace in the vision of you affecting the rhythms of the universe out there in the other world. Thank you so much for sharing your thoughts, everyone. I deeply regret that I was unable to make today's memorial. (I had a previous commitment to cover the Bang on a Can marathon.) I'm sure the jazz community turned out in force -- Take meant so much to so many. Take was also a bandleader and creative force to be reckoned with: He put together one of the most remarkable combinations of musicians I've ever seen for a gig at Bar 4: a trio of himself on drums and electronics, Tom Rainey on drums, and Ben Monder on guitar. Few musicians have the courage to create bands like that, let alone to make it successful like Take did. He was an inspiration. we had so much fun playing and talking and touring and discussing and watching "ocean`s 11". goodby my friend. see you later! I am still in shock and deeply saddened by this great loss. Take was my former roommate in Woodhaven, New York and my friend. We played a lot of gigs together and hung. I learned so much from Take. Take was sincere, honest, serious yet funny, creative, very passionate, strong, driven, soulful and one of the baddest drummers. Take could play in any meter, metric modulation, polyrhythm and read anything as well as swing & groove with fire! Take was also unique...his voice on the drums was distinct. Take Toriyama. Take Toriyama. Take Toriyama. When I left for Take's funeral it started raining and so it did for almost 24 hours straight. Now the sun is coming out but I'm still devastated and confused. It was painful to see his parents suffer. Take left and we all have to deal with it. From what I learned it was a very conscious decision on his part. The priest talked about a "sickness of the mind" but I'm at a loss when I try to imagine what went on in Take's head the last few weeks of his life. Very moving speeches by Hal Crook, Yoshi Waki and Oscar Noriega. When Take's brother thanked everybody and apologized for the pain this caused us, I just completely lost it. For me, Take's spirit will live on. His dedication, sensitivity, humor and boundless creative energy taught me a lesson for life. Wow. I am floored by this news. I just found out about Take's passing. It is particularly perplexing to me, because as much as I remember Take's incredible playing and ability to instantly hook up musically and personally with new people, I also remember his deadpan sense of humor, musical and otherwise. He seemed such a profound person; understanding of the world and at peace with it and himself. We have lost one of the great ones. If there is a lesson to be learned by this, it is perhaps a deeper awareness of the disease of depression, the need for its study and treatment, and for the need to reach out to people suffering with it. The time I played with Take was a trio plus singer gig, me being the singer. Our pianist had to miss the first set, so I sang from behind the keyboard. My playing is competent at best, and I was a little nervous playing with a bassist and drummer out of my league. I needn't have worried: Take made me feel like Keith Jarrett. Every idea I played was answered by a musical, "Well isn't that clever!" or "You don't say!" from the drums. It is the most fun I ever had playing piano. TaKe Toriyama was, not only a good friend and musical soul-mate, he was perhaps THE best over-all musician I have ever worked with. I hated to see him leave Boston, but knew he would do well in New York…he was always so creative and supportive musically….always dependable, and always uplifting. My memories of TaKe…… on gigs, recording sessions, talks, toasts…..they are ALL good…. What a devastating loss…. Even those of us who just discovered Take Toriyama through Slavic Soul Party are griefstruck by his loss. My 2 kids and I heard SSP in Providence and fell head over heels in love with the music and with his unmatched talent - we were and continue to be dedicated fans and deeply inspired by his work. Now we will find everything we can of his, to listen to. We send our soulfelt condolences and will cherish our one live encounter with his music. While it was a welcome surprise to hear Slavic Soul Party on NPR's Weekend Edition this morning as I had recently heard the band live, I was startled by the band's dedication of the last tune in their radio spot to their dear friend, Take Toriyama. Although I did not know him, I clearly remembered his wonderful playing and joyful energy at the band's performance at Mass MoCA. I send heartfelt condolences for his untimely, tragic loss to all who knew him as band member, fellow musician, and friend.